Corona Cigar Company Blog: A Cigar Tasting Experience with Rex from Ashton! A Cigar Tasting Experience with Rex from Ashton! 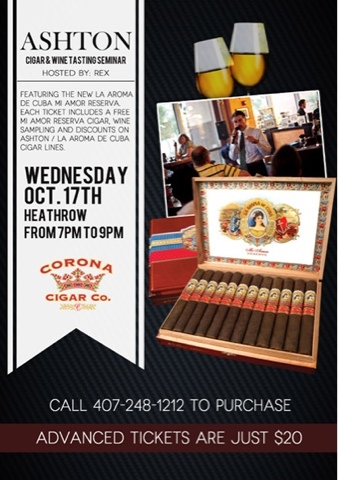 We've got another awesome Mi Amor tasting coming to Corona Cigar Co. Rex will be back in town with the new Aroma De Cuba Mi Amor Reserva. This tasting experience will be $20 for advance tickets. The $20 price includes a Mi Amor Reserva and a glass of Balvenie 14 year Caribbean Cask to pair with the cigar. Rex will guide you through an extensive and unique cigar tasting experience allowing you to greater appreciate the fine art that is cigars. Make sure to buy your ticket for Wednesday October 17th at our Heathrow location. Trick or Trade Xikar Lighter Event!